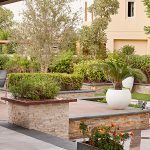 Landscaping in Dubai can be challenging if you reside in the city limits. Luckily you have options! Rooftop gardens aren’t a new concept. City residents have been transforming the sky-high city landscape by tucking plants and flowers away on fire escapes and roofs for generations. With even the smallest of rooftop spaces, you can plant a garden and create an outdoor living space where you can bask in the sun and enjoy the rooftop views. Rooftop gardens of all sizes are growing in popularity in both commercial and residential sites. Whether you already have a rooftop garden or in the early stages of planning one, we’ve compiled a few design ideas and tips to help you create one of most beautiful rooftop garden designs on the block. 1. Plan an open design. When you plan an open design, even the smallest of rooftops appear spacious. Consider incorporating transparent glass instead of a wall to maintain the view. You can add hedges instead of fences to create separate areas. Worried about privacy? Adding curtains around your seating area allows you to shield your space whenever you want a little more seclusion. 2. Plant tall trees and plants. If you have a spacious rooftop, want to mask a poor view, or you want to create the illusion of a traditional garden, using tall vegetation around the walls will maximize greenery while simultaneously separating your space from the rest of the city. 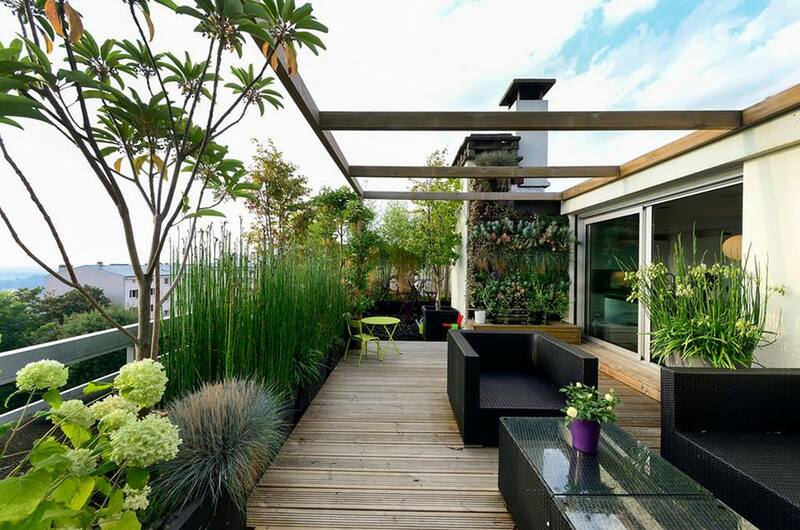 The combination of tall grasses and bamboo is an excellent low maintenance option to create a private rooftop garden. Grow trees, shrubs, foliage plant, flowering plants and annuals for a burst of color. You can even grow edibles to take your culinary arts to the next level. Mixing in shrubs and small potted trees will add to the lush look of your rooftop terrace. 3. Incorporate raised garden beds. If your roof provides enough space, consider creating raised beds adjacent to the walls for planting flowers, vegetables, and/or herbs. Depending on your design scheme, you can add metal or wooden raised flower beds. If you decide to add raised beds, be sure to incorporate a waterproofing membrane and add a thick root barrier to prevent root damage to the roof. When it comes time to decide which plants to add to your rooftop terrace, keep it diverse. Add a combination of large plants, small trees, ground covers, annuals, and shrubs. You can even get creative with colorful pots and plant stands. 4. Add comfortable and practical furniture. When it comes to planning your rooftop garden, every inch of space counts. It’s important to decide the type of furniture you want to incorporate into your design scheme. Start by determining how you want to use your rooftop garden? Do you want to create an outdoor living space to relax and lounge or do you plan on dining al fresco under the stars? 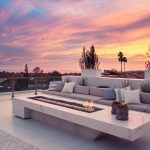 Once you determine how you will use your rooftop space, you can select furniture that fits the style, theme, and purpose of your garden. If you are tight on space, keep it simple with a small bistro table or a few comfy chairs with decorative end tables. You’ll be spending a lot of time on your new rooftop garden. Incorporating a custom water feature, water wall, or water fountain will add the soothing sights and sounds of water to your space. 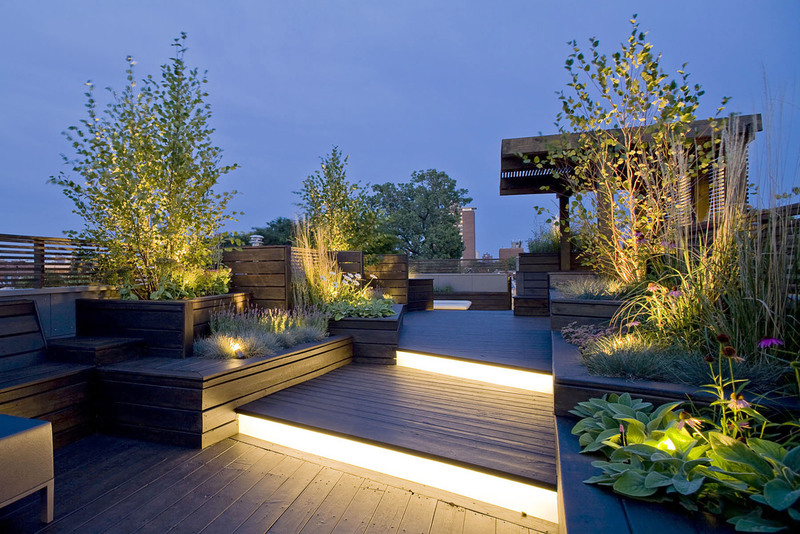 Lighting is also a great way to enhance your rooftop ambiance. Not only will lighting create a mood, but it also keeps your space safe for visitors when night falls. Lighting your roof will also make it look larger at dusk. When you transform your rooftop into an outdoor living space be sure to design from the ground up. Make use of your vertical space to create the illusion of more space to your rooftop garden. Hang planters on the walls, add railing planters, and grow plant foliage that climbs. And don’t forget the flooring! Choose a flooring type that fits your budget, suits the climate you live in, and accommodates the theme of the rooftop garden. 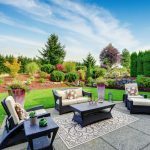 Depending on your budget and design scheme, you can add artificial grass, pebbles or outdoor rugs to enhance your new rooftop space from the ground up. Sometimes a pergola, sail shade or an aluminum canopy may help to create shade and a nice elevation. An elevation is one way to get lights and fan too into your terrace and makes it feel defined and cosy. When it comes time to design your rooftop garden stay true to your personal tastes. Your rooftop terrace is an extension of your interior space. With a well planned urban rooftop garden, anything is possible. 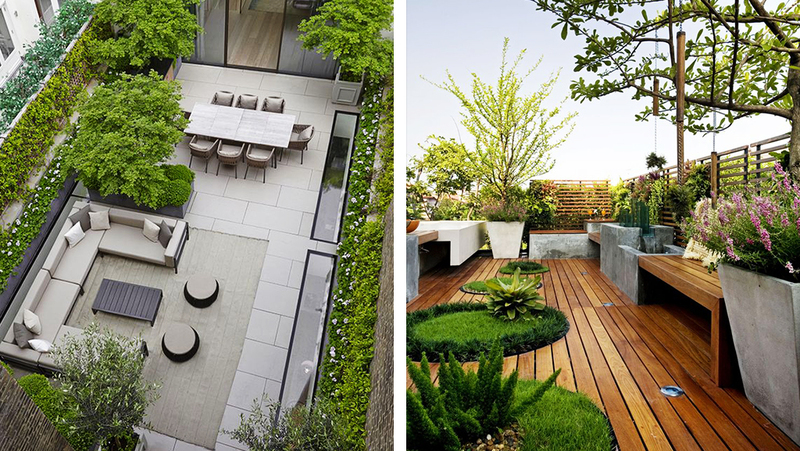 Are you considering adding a rooftop garden or rooftop living space to your home? Contact the design experts at Milestone; we’d love to help!